Catch Up® success in London! 6th July 2017 - Catch Up® success in London! 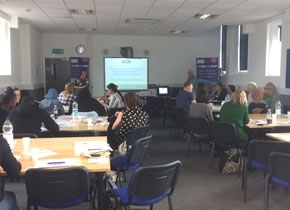 Thank you to everyone who joined us at Tower Hamlets PDC last Friday, to hear about implementing and sustaining high-impact literacy and numeracy interventions. The lunchtime seminar was led by one of our Catch Up® Accredited Trainers, Alison Haines, who delivers Catch Up® training to teachers and TAs every term at the Tower Hamlets PDC, where she also delivers our new free follow-up sessions. We were delighted to hear from Interventions Teacher, Ruth Deer, and Teaching Assistant, Michelle Walker, from The Jenny Hammond Primary School in Waltham Forest, who talked about their experience using Catch Up® Literacy and Numeracy. The Jenny Hammond Primary School are currently delivering Catch Up® Literacy to 7 pupils in years 3-6 and Catch Up® Numeracy to 10 pupils in years 2-5. Ruth explained how they got set up for the interventions by selecting learners and making sure the resources they needed were in place for sessions, and then carrying out the Catch Up® assessments for learning, to establish the specific focus for the individual sessions. “The impact that it’s had on the children has been greater than anything I’ve seen in any other intervention,” said Michelle, who has been a Teaching Assistant for 14 years. Ruth, who performs the role of Catch Up® Coordinator for the school, advised ‘safeguard the time for TAs who are delivering the interventions’ to make sure they happen. She also told us how the Classroom liaison sheet, which we created last year, and the new Progress Reporting Tool were helping with their Catch Up® work. Alison then ran through the elements of the Catch Up® Training and Support package, including introducing new opportunities available for trained staff, such as the Review and Refresh sessions, Coordinator network meetings and in-depth workshops, and showing us the new Progress Reporting Tool, which Catch Up® schools can now use to track and easily report on progress. We hope the seminar was useful for all those involved. Thank you again to all of our presenters and schools who came and contributed. Find out more about training and sessions running at Tower Hamlets PDC.